This year the Stand Up To Cancer appeal is going to be bigger and better than ever and hopefully raise a ton of money for Cancer Research UK. One of the events is the March On Cancer, which is happening tonight, in fifteen cities across the UK. Birmingham, Bristol, Cambridge, Cardiff, Chester, Edinburgh, Liverpool, London, Manchester, Newcastle, Norwich, Plymouth, Portsmouth, Sheffield and Southampton will all March On Cancer tonight. I am very proud to say that my husband is the drummer who will be leading the Cardiff March On Cancer. Hopefully, Myself, Bunny and the Twins will march too. The march is for 2-3 miles and lasts about 45 minutes, but there is entertainment in each city making the event last an hour and a half in total. As you all know, I’ve fought Cancer twice (Leukaemia and Thyroid cancer) and am about to have minor surgery to prevent a third cancer, after pre-cancerous cells were found on my cervix. So Cancer Research UK and the Stand Up To Cancer appeal are both very close to mine and my husbands hearts. I would be truly grateful if you could spare £1 or two to sponsor my husband, who will be both marching and drumming to lead this event through the streets of Cardiff. I have also linked his fundraising page to the #EmmasArmy team page. If you are near to a city which is participating in the March On Cancer… please do go down and support the event… the marchers, the drummers, the singers or if you want to – you can even march yourself. More details are on the Stand Up To Cancer’s March on Cancer website. Please share this post, and ReTweet anything you see on Twitter about #StandUpToCancer or #MarchOnCancer over the next week or so. 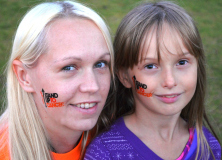 Channel 4’s Stand Up To Cancer TV show will air on Friday 17th October 2014. This entry was posted in #EmmasArmy, Cancer, Charity / Awareness, Family, Health, Medical, Radioactive mum, Sport, Travel and tagged Cancer, Cancer Research UK, Charity, Fundraising, March On Cancer, Raising awareness, Stand Up To Cancer. Bookmark the permalink.